So last night I completed the Advanced Communciator Speaking on Television manual and more precisely project#4 The Press Conference. 2 out of 30 speeches completed! It was a hard project to do... I had been avoiding completion of this manual because I found the press conference really difficult to plan. I didn't want to sugar coat it with a fictional situation. In desperation the night before I tossed my mentee an SMS asking for help and he immediately replied back with the name of my oncologist who was recently forced out of his position locally. After a frantic night of research I was prepared to take on this project. I represented the health authority, a position that I very much disagree with, and I endeavoured to convey myself in a neutral and diffusing manner. There were a number of people in the audience who were familar with the subject matter and had friends/relatives who were profoundly helped by the oncologist and thus had very strong emotional opinions on the issue. It was a TV presentation so I had to limit gestures, I slowed down my voice, lowered it artificially in spots, kept myself calm and asserted control of the crowd. After ten minutes of being grilled in a Q&A, and literally sweating from the pressure, I returned to my seat to a standing ovation from the crowd. One of my challengers said that it was in the top three projects he had ever witnessed and it was a sincere challenge. 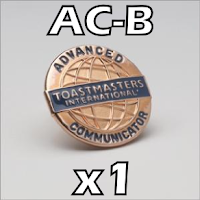 This wraps up my Advanced Communicator Bronze designation. It took me almost five years to complete. Five years ago I couldn't have done this project if my life depended on it. What a trip! Fortunately Advanced Communicator Silver should be faster given that I'm already mostly through many other advanced manuals.